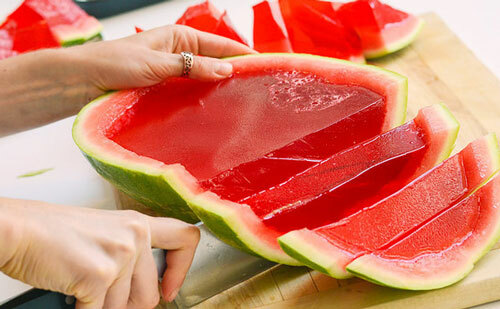 Watermelon Jelly Slices - What About Watermelon? 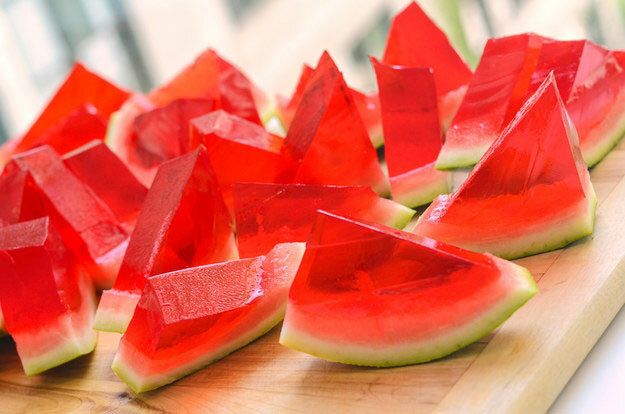 Perfect for birthday parties, these watermelon jelly slices are sure to be loved by the whole family. These sweet treats will offer uniqueness to any occasion and are super simple to create! Cut watermelon in half longer ways. Using a large spoon, scoop out all of the interior watermelon flesh and seeds. The remaining watermelon flesh can be used to make another one of our recipes! Line two baking trays with paper towel as this will create a bed for the watermelon halves so they do not tip over while setting in the fridge. Place your watermelon halves on separate trays on a flat surface. Boil a large kettle and measure four cups worth of boiling water. 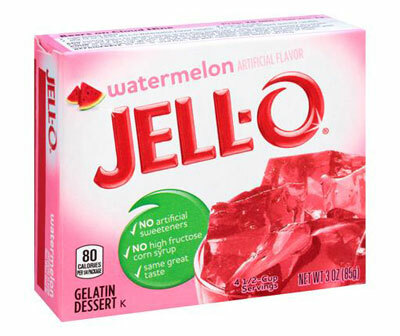 In a bowl combine the Jell-o mix, the unflavored gelatin and the boiling water and stir consistently with a spoon until all crystals have dissolved. Once combined, slowly pour the gelatin mixture evenly into your watermelon halves, adding a scatter of blueberries as you go. When your jelly is set, using a sharp night cut across ways to make 1 inch slices. Once you have cut 1 inch slices, then cut these so that you have two smaller triangles. 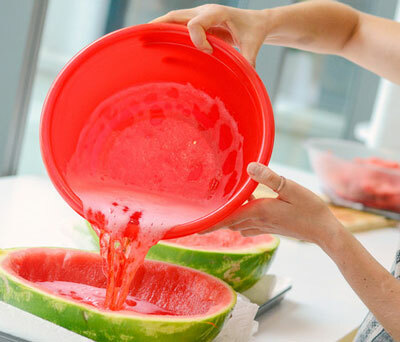 Place your watermelon jelly slices on a serving platter to be enjoyed.